Our Rewards & Club programs can be customized to achieve specific goals. For example, we offer programs to sell, manage and track Pre-Paid Maintenance such as Used Car, Manufacturer, and/or Oil Change memberships. Tracking and Calculating is one aspect, but delivering marketing solutions to customers that utilize these programs is key to our success. We got this! Every program comes with everything needed to succeed. PrePaid Maintenance has long been understood to be a great retention tool in the automotive industry, so why do so few dealers have pre-paid maintenance programs? 3rd party vendors that offer to administer these programs are expensive and do a very poor job of making it easy for the adviser to recognize which customers have a plan and what the customer has available. Customers lose touch with what they had purchased and spoilage, lowering of CSI and loss of retention are the results. 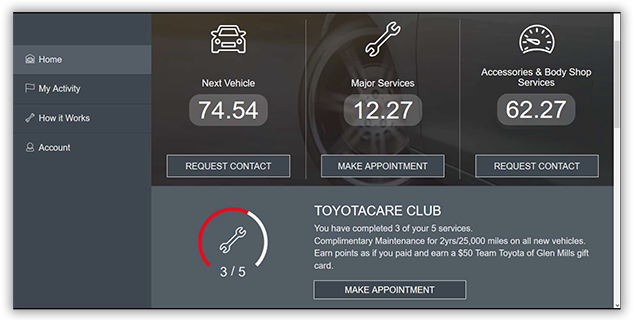 SmartTech has tackled PrePaid Maintenance using the same tools used for rewards and all other custom clubs. Using SmartTerm, the adviser will automatically be notified when a customer has a plan and what they have available to them. Customers will be handed a printed form with their program status on each visit and the customers personal portal page will show their status as well. Ad a state of the art database and optional marketing tools and PrePaid Maintenance programs sold in either F & I or service become very manageable! 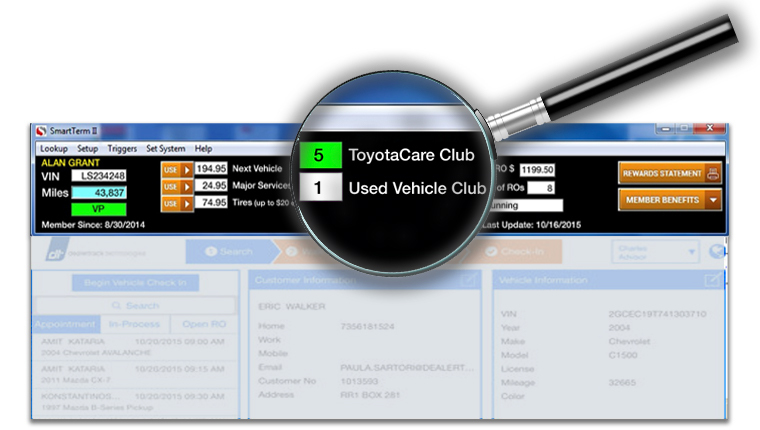 SmartTech Clubs are customized retention programs with specific retention goals in mind. These programs are managed and communicated with SmartTerm software. Sell more vehicles by offering 1 o r 2 year maintenance plans and double the retention of these older, higher mileage vehicles in your service department. Factory programs like ToyotaCare or SubaruCare can be enhanced by providing extra incentives to the consumer for completing these services at your location. Tired of unmanageable programs like Oil Change, Lifetime Alignment, and Lifetime Rotation programs with no tracking, no reporting, and the ingerent fraud... no more! 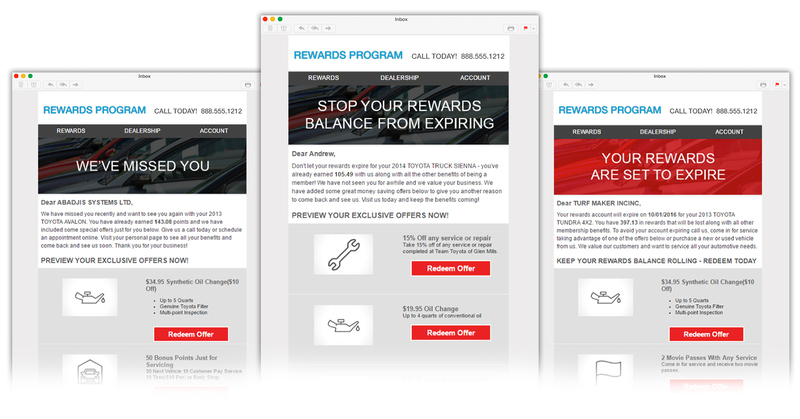 Why is rewards such a powerful tool in your dealership. Rewarding your best customers in ways that are of value to them when they purchase another vehicle or perform profitable services is the obvious. 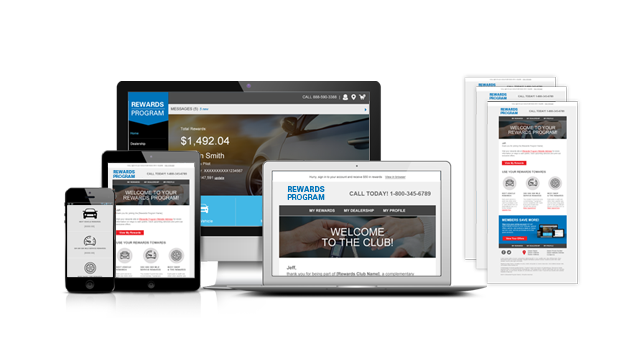 Rewards points also profile your best customers and lend themselves to literally every marketing touchpoint in the dealership. SmartTech has taken the power of rewards and integrated it with a state of the art turn key multiple stage inactive program. Customers travel through the stages of “We Miss You”, “Don’t Let Your Rewards Expire” and “Your Rewards Are Set To Expire” with increasing awareness that they will lose valuable rewards points and incentives that become more aggressive with each stage. Through 7 months of email and an integrated, personalized customer portal that is time sensitive to how long it has been since the vehicles last visit combined with additional strategically placed physical mail SmartTech has shifted the model for “reactivating” your vulnerable customers in a positive direction. It simply works!